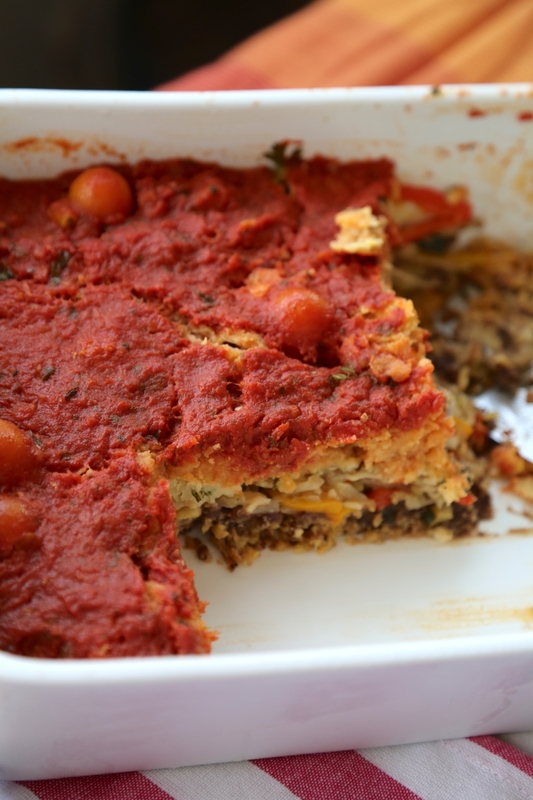 This is a delicious, comforting dish prepared across India with many delicious variations. Uppu means salt in many south Indian languages. The most popular version is made with semolina or suji. In Karnataka it is Uppittu or Kharabhat, in Maharashtra upeeth, in the Konkan, usli, and is served with coconut chutney. 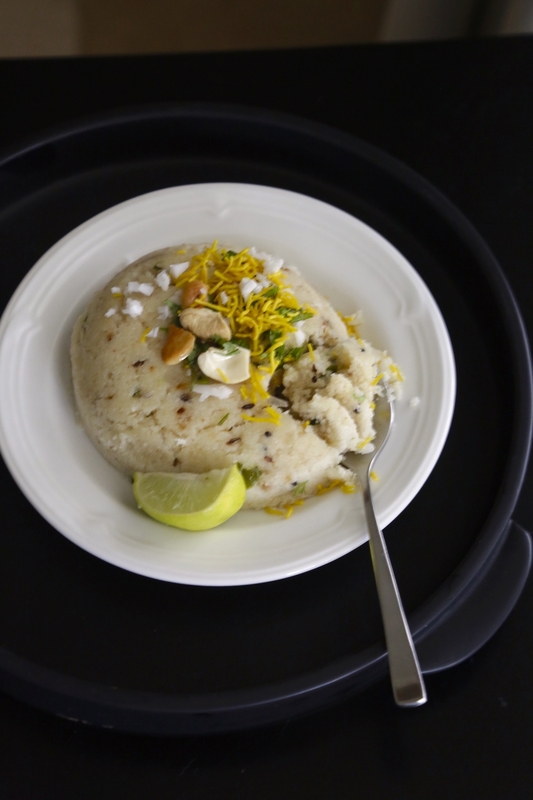 In the north, it is upma, served with yogurt; and in Tamil Nadu, uppumavu is creamy and moist. Upeeth is also made with rice and wheat vermicelli, day-old bread and corn. Our family version is crumbly semolina, topped with fried sev, cashews and fresh coconut. For a little colour and a dose of vitamins add cooked green peas to it. Bring 4 cups of water to a boil in a pan with the salt and sugar. If you need to boil the green peas, add them to the water. When the oil is hot, add the mustard seeds, cumin seeds, fenugreek seeds and let them cook 30 seconds. Add the urad and asafoetida, the curry leaves, green chillies and ginger and cook 30-60 seconds. Add the onions and sauté, till they soften; do not brown the onions. Reduce heat to medium and add the semolina. Stir well and sauté for 5-6 minutes until semolina is fragrant and toasty. Switch of the flame under the boiling water and slowly pour it over the semolina, with the green peas if you are using them. Stir vigorously. The semolina will boil and spit and slowly begin to solidify. Keep stirring to prevent lumps. Reduce heat and continue to stir, till the semolina has a crumbly texture and all the water has evaporated. This will take several minutes. Some prefer their upma sticky. Add a little extra water and cook it down for a shorter period. Taste for salt, sweetness and adjust to your taste. Garnish with all the extras and serve warm with wedges of lime. 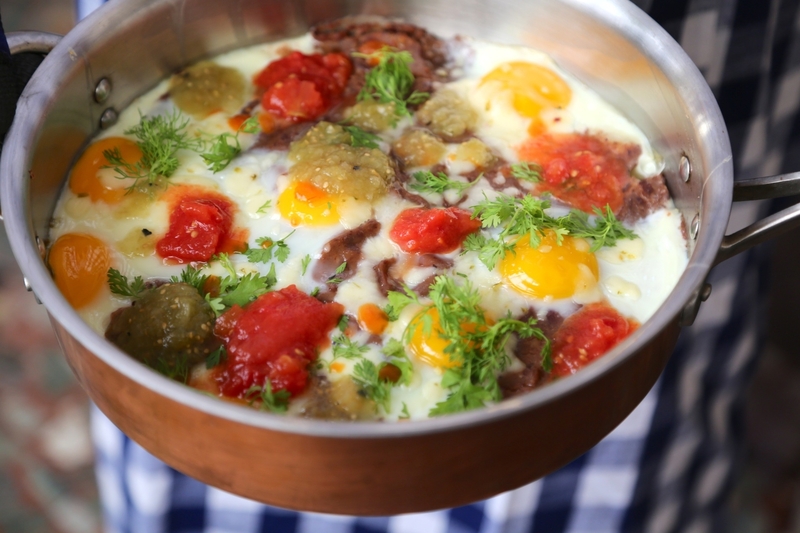 This is a wonderful dish, a colonial recipe for a brunch or breakfast meal. You can make it entirely vegan without the butter. 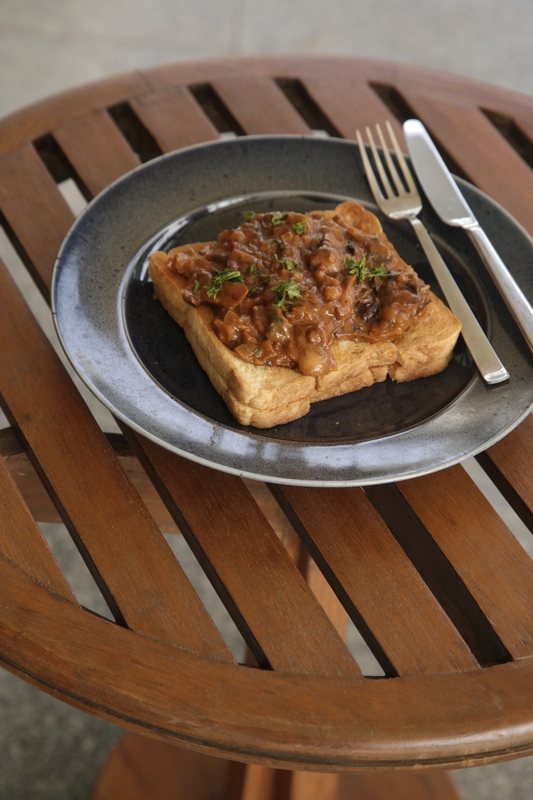 Serves it on thick slices of toasted and buttered bread so the bread can absorb the mushroom sauce. USING A WET TOWEL WIPE THE MUSHROOMS AND DUST OFF ANY MUD OR DIRT WITH A FOOD BRUSH. THEN WIPE AGAIN WITH A CLEAN WET TOWEL. USE A SHARP KNIFE TO CUT SOME OF THE STEM OFF EACH MUSHROOM BUT NOT ALL OF IT- ONLY THE PARTS THAT ARE SOFT AND MUDDY. SLICE THE MUSHROOMS INTO 4-5 PIECES LENGTHWISE. HEAT BUTTER AND OIL IN AN EXTRA LARGE SKILLET ON MEDIUM HEAT. ADD CARAWAY SEEDS AND COOK UNTIL THE SEEDS SIZZLE. ADD ONIONS AND SAUTE 3 MINUTES UNTIL ONIONS BEGIN TO BROWN. ADD CHILLIES, GARLIC AND TOMATOES AND COOK 1-2 MINUTES UNTIL TOMATOES SOFTEN AND LOSE WATER. STIR IN 1/2 TSP OF MAIDA AND MIX WELL WITH THE SAUCE. ADD MUSHROOMS AND SAUTE UNTIL MUSHROOMS SOFTEN A BIT. THEY NEED TO HOLD SHAPE SO DON'T OVER COOK THEM. ADD SOY SAUCE, BROWN SUGAR AND SALT TO TASTE. COOK UNTIL MIXTURE THICKENS A BIT. SPOON OVER BUTTERED TOASTS OR SERVE IN A BOWL ACCOMPANIED BY SOLDIERS- TOASTE BUTTERED BREAD CUT INTO FINGER SIZED SLICES. Bostock is a French toast like no other. A classic from Normandy the bread can be soaked and layered several hours before you are ready to bake it. Boil together 1 cup castor sugar, 1 tbspn brown sugar, 3 inch stick of cinnamon and 2.5 cups of water on a medium flame until you have 1 cup of syrup. Cool, strain and discard cinnamon stick. Stir in 1 tbsp rum or brandy. Keeps refrigerated for a month. Great in cocktails, over gelato and bread pudding. Whisk the egg, milk, vanilla, sugar and cinnamon together. Pour into a 9 by 12 inch cake pan. Place the 3 slices of bread in the egg bath and allow them to absorb the liquid on both sides. Spread the top of each slice lightly with the marmalade or jam of your choice. If you plan to bake this later cover tightly with plastic wrap and refrigerate for a few hours or overnight. Let it reach room temperature before you bake it. Preheat oven to 350F and prepare middle rack. Whisk together all the ingredients for the frangipane in a medium mixing bowl using a balloon whisk. You should have a wet, soft, easily spreadable mixture. Divide this mixture into 3 portions and spread over the marmalade on the brioche slices. Bake in the middle rung until the frangipane is bubbly but still moist about 20-25 minutes at 350F. Remove cake pan and using a sharp flat spatula remove each slice onto a plate. 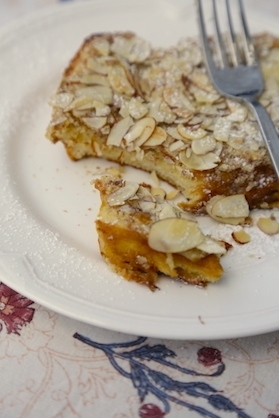 Top with toasted almonds and powdered sugar. Serve warm as is or with cinnamon syrup, fruit compote or mild honey. 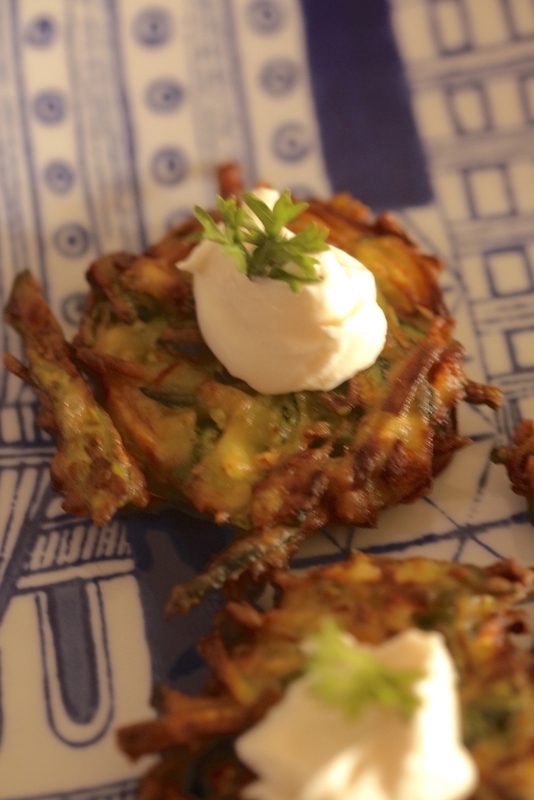 These latkes are vegan and gluten free. They are also Jain. Latkes a Jewish specialty are made during Hanukkah- the Festival of Lights. Shredded potatoes, flour and eggs are mixed together to make a misshapen crispy pancake that is served with sour cream and apple sauce. These latkes use chick pea flour and rice flour to produce a really crispy mini pancake that is less oilier than the traditional latke. They make wonderful passed hors d'oeuvres.Garnish them with a variety of toppings such as smoked salmon, caviar, vegan apple chutney, strained yogurt, sour cream even salsa. It should be shredded thick and the length should resemble matchsticks. Shredding them to thin causes the zucchini to leak water. I use a julienning tool and then I cut them into smaller lengths with a scissor. In a dry non stick pan saute the rice flour and gram flour separately on a medium flame about 2 minutes. Cool completely and set aside in 2 separate bowls. Cut the julienned zucchini into smaller pieces- about matchstick length. Stir in the green chillies and all the chickpea and half the rice flour. Mix manually. Allow the flours to absorb all the liquid from the zucchini. Let sit 1 minute. Once you have a dryish mixture add a tablespoon of water and mix again. Slowly add the remaining flour teaspoon by teaspoon until you have a mixture you can form into small loosely held together cakes. The mixture should not drip. Add only as much rice flour as required to hold the zucchini together. Reserve any excess for a different recipe. Heat 1.5 inches of oil on medium heat in a non stick frying pan until very hot but not smoking. Drop a small piece of the batter to test the oil. If it sizzles and rises to the top the oil is ready. Form the zucchini mixture into small pancakes on the base of your hand and slide them into the hot oil about 4-5 at a time. Cook until both side are golden brown. Drain with a slotted spoon and then place onto paper towels. Turn over so that both sides are well drained. Let cool 5 minutes. Garnish with a topping of your choice. I used strained yogurt and parsley. ONE OF MY FAVORITE DISHES TO EAT FOR BREAKFAST AND SO EASY. SOMETIMES I USE CHOPPED ITALIAN BASIL INSTEAD OF CILANTRO- SO YUM. HEAT OIL ON A MEDIUM FLAME AND SAUTE ONIONS UNTIL VERY SOFT BUT NOT BROWN. ADD GARLIC AND SAUTE UNTIL SOFT AND FRAGRANT. ADD BAKED BEANS AND HOT SAUCE AND STIR WELL. ADD 1 CUP WATER AND SIMMER ON A MEDIUM FLAME ABOUT 10 MINUTES. STIR IN CHOPPED HERBS. TASTE FOR HOT SAUCE, SALT AND SUGAR AND ADJUST. POUR BAKED BEANS INTO A 10 INCH SKILLET AND SPREAD ABOUT. MAKE SIX WELLS AND CRACK 6 EGGS ONE INTO EACH WELL. COVER WITH A LID AND COOK ON A SLOW FLAME UNTIL EGGS ARE READY. CHILAQUILES IS A MEXICAN DISH OF TORTILLAS SIMMERED IN SALSA. THE FIRST TIME INATE IT WAS DURING A TRIP TO MEXICO CITY. THE DISH CAME AS A SURPRISE BECAUSE IT CONTAINED NO CHEESE OR EGGS. 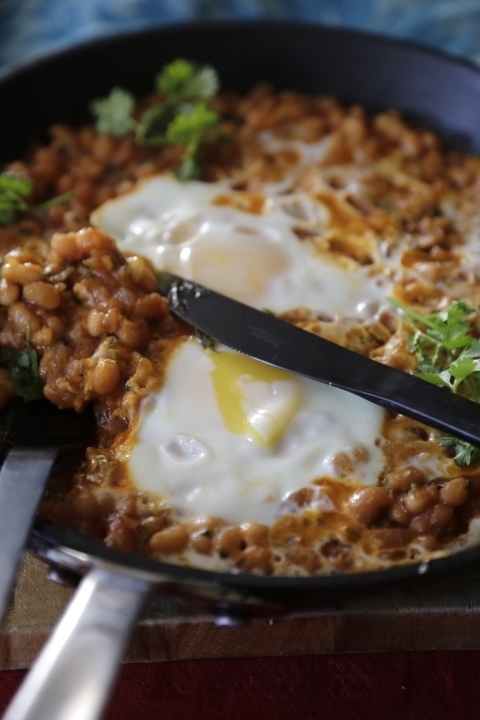 THERE ARE MANY VERSIONS OF THIS DISH IN MEXICO, SOME WITH PULLED MEAT, FRIED EGGS AND REFRIED BEANS. MINE CAN BE VEGAN IF YOU OMIT THE CHEESE. I SOMETIMES SUBSTITUTE THE TORTILLAS FOR LEFTOVER SALI WAFERS. TORTILLA CHIPS AND SALI ARE GENERALLY SALTED SO KEEP THIS IN MIND WHEN YOU SALT THE REST OF THE DISH. HEAT 2 TBPNS VEGETABLE OIL IN A DUTCH OVEN TYPE POT ON MEDIUM FLAME. ADD HALF THE ONIONS AND HALF THE GARLIC AND COOK UNTIL SOFT OVER A MEDIUM FLAME-DO NOT BROWN THE ONIONS. ADD ALL THE VEGETABLES AND SAUTE UNTIL JUST TENDER. SWITCH OFF FLAME AND RESERVE VEGETABLES ON A PLATE. ADD REMAINING VEGETABLE OIL (2 TBSPS) TO THE SAME PAN ON A MEDIUM FLAME. 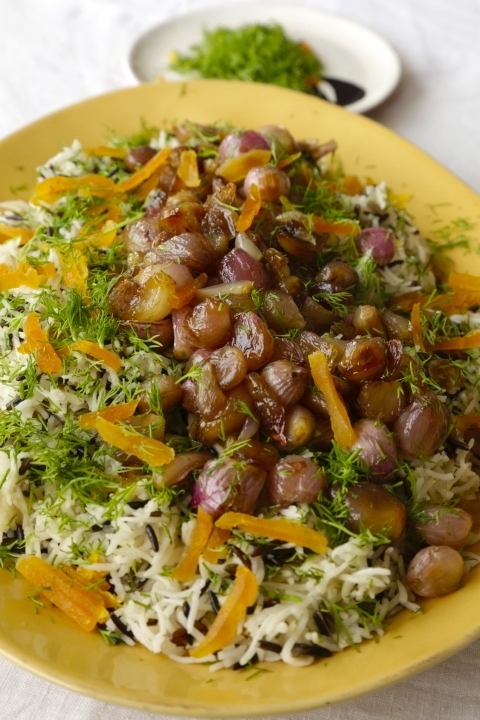 ADD THE REMAINING ONIONS AND GARLIC AND COOK UNTIL SOFT AND FRAGRANT ABOUT 2-3 MINUTES, STIRRING TO PREVENT BURNING. STIR IN CANNED AND CHERRY TOMATOES, 2 CUPS OF WATER AND CHIPOTLE AND SIMMER UNTIL BUBBLY. ADD SALT, MORE CHIPOTLE OR HABANERO SAUCE AND IF THE TOMATOES ARE SOUR SOME SUGAR TO TASTE AND RESERVE. GREASE A 9 BY 13 BAKING DISH LIGHTLY WITH VEGETABLE OIL. CRUSH THE TORTILLA CHIPS AND SCATTER AT THE BOTTOM OF THE PAN AND PRESS DOWN TO CREATE A FLATTISH SURFACE. TOP WITH THE BEANS AND COOKED VEGETABLES. POUR TOMATO SAUCE OVER THE VEGETABLES. USING A FORK GENTLY PRESS INTO THE LAYERED CASSEROLE AND MOVE THE FORK ABOUT JUST A LITTLE TO ALLOW THE SAUCE THE FALL TO THE BOTTOM OF THE PAN. COVER WITH FOIL. MAKE SMALL HOLES IN THE FOIL WITH A FORK AND LET STEEP 1 HOUR. BEFORE YOU PUT THE DISH IN THE OVEN OPEN THE FOIL AND CHECK THAT THE SAUCE HAS PERMEATED TO THE BOTTOM LAYERS AND SOAKED THE TORTILLAS. BAKE CHILAQUILES 1 HOUR. REMOVE FOIL AND BAKE ANOTHER 20 MINUTES UNTIL SET. REMOVE FROM OVEN AND LET SIT 15 MINUTES. GARNISH WITH GREEN ONIONS, SOUR CREAM AND CHEESE IF DESIRED. SERVE WARM. 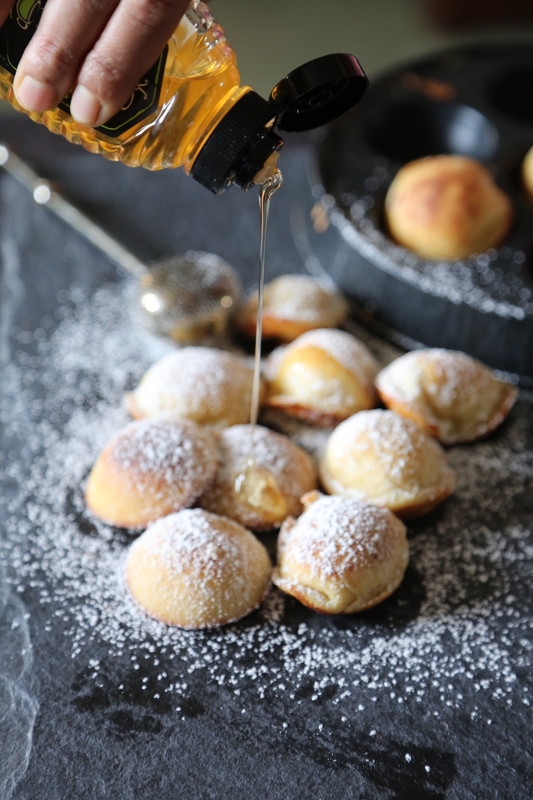 Ebelskivers are fluffy mini Danish pancakes made over a stove top. You can buy a special pan to make these or use an Appe Patra pan sold in shops and online in India. They are made plain, stuffed with various jams, chocolate chips and many variations. You can served them dusted with confectioners sugar, honey and jam on the side. Some pans come with a small hooked bamboo tool that is used to flip the pancakes over but you can also use 2 chopsticks, large toothpicks or a small plastic fork. In a small bowl, mix together flour, baking powder, and salt. In a large mixing bowl, whisk together egg yolks, milk, and melted butter and vanilla extract until combined. Stir in dry ingredients. Mixture should be lumpy—do not over mix. Whisk egg whites with an electric mixer or whisk until stiff peak forms and gently fold egg whites into batter. 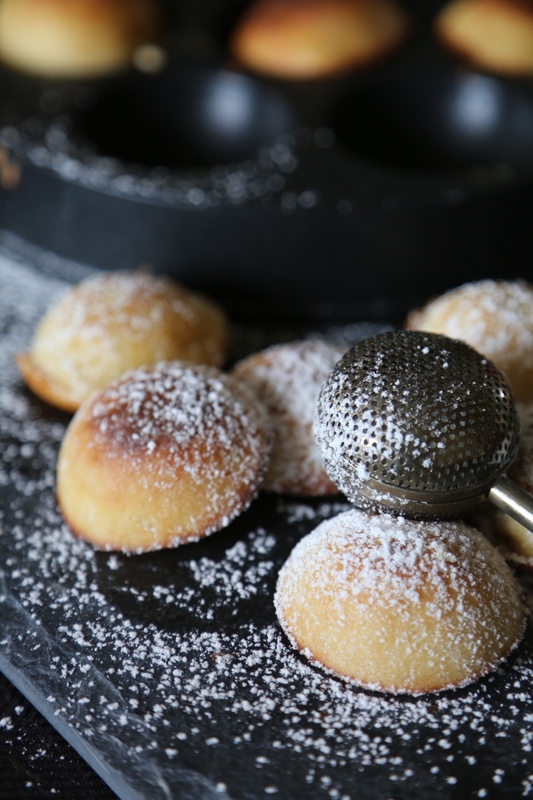 Put ebelskiver or appe pan over medium high heat. Using a pastry brush generously bruch each cavity with melted butter.When hot and sizzling add 1.5 tablespoons of batter to each cavity. Make sure to leave a little space as the pancakes will rise when they cook. Lower flame. Cook Ebelskivers until bottoms are golden, about 3-4 minutes, then using a small toothpick, special ebelskiver bamboo tool or a small fork flip the hemispherical pancake over and continue to cook until bottoms are also golden, 3-3.5 minutes more. Transfer to a plate and cool 1-2 minutes. Dust with confectioner's sugar and serve with sides. Idlis are often associated with Tamil cuisine even though Udupi, the symbolic home of idli is in Karnataka. Karnataka has many unusual idlis and dosas (called Poley). One of them is Hittu, a fluffy idli batter that's poured into molds made from jackfruit leaves. Jackfruit is very popular in India and while its fruit has many culinary uses its leave are used to prepare a special idli in Konkani and Kannada homes. Jackfruit leaves are called Khotto or Hittu in Konkani and Khotte Kadubu in Kannada. In a sense this idli is a food shared by many communities. 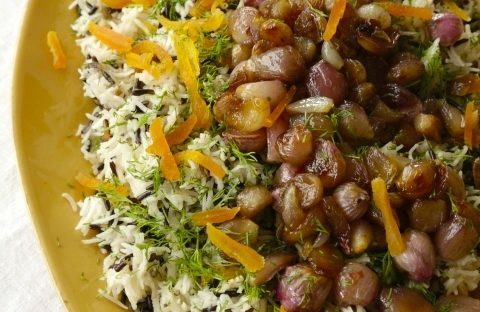 While it is associated with Karnataka, Marathi speaking families also prepare this delicacy. Turmeric and banana leaves are also used to prepare idlis like Taushe and Kadamb made from cucumber, Patholi, a thin steamed dosa and Erayde a sweet dish made for Nagapanchami. In Orissa Haldi Patra Enduri is a variety of Idli made using turmeric leaves to celebrate the first born. In Mangalore a similar idli made with jackfruit leaves is called Gunda. Hittu idlis are made in cups fashioned out jackfruit leaves pinned together using pins made from coconut shells, toothpicks and broomstick pins. These idlis are served for various courses, breakfast, lunch and as a snack. They can be served with chutney and sambhar, with melted butter and ghee, warm coconut oil, rasam and with a ground spice mix or podi. Turmeric leaves have a strong aroma that is infused into the idli as it steams. Jackfruit leaves are far milder so the idlis can be additionally flavored with various spices. Day old Hittu idlis are diced and tossed with whole tempered spices, crispy pan fried and sprinkled with powdered spices, while fresh idlis are turned into dessert by soaking them in a sweetened coconut milk. Soak urad dal for 40 minutes. Rinse and drain completely. Grind them using as little water as possible into a smooth paste. Transfer the ground batter into a larger mixing bowl- the batter will rise overnight so make sure you use a bowl that can accommodate 4-5 inches of fermentation. Stir in the semolina and mix well. Add 1 cup of water and stir again. Cover the bowl with a loose lid, set it in a dry but cool part of the kitchen and let it rise overnight on a cool day and 7-8 hours on a hot day. Use 4 leaves for each jackfruit cup. Lay them together to form a square, layering one end over the other to form the base of the cup. Pin the base together using 2-3 pins. Then turn the other ends inwards and gather them together to forma . cup. Tie each leaf to the other using a small pin. Grease the cups lightly with ghee or unflavored vegetable oil. Stir the batter again. Add a little more water if required. Your batter should be the consistency of a fluffy cake batter. Place the jackfruit molds in the steamer and fill with batter leaving about 1/4 inch off the rim of the cups. Cover the steamer, close and steam them for 20-30 minutes on a medium flame until the tops look set. Remove one and check for doneness. Serve these idlis hot. You can peel the leaves off 2-3 minutes after they've been removed from the steamer and sprinkle with podi, ghee or serve them in their cups with a side of coconut chutney and rasam or sambhar. BRUSH THE BOTTOM OF A LARGE 10 INCH WIDE SKILLET. IF YOU PLAN TO USE AN OVEN THE SKILLET SHOULD BE OVEN PROOF. SPREAD THE TORTILLA STRIPS ACROSS THE BOTTOM TO FORM A BED FOR THE BEANS. SPREAD THE BEANS ALL OVER THE TORTILLA STRIPS TO FORM A SMOOTH AND EVEN SURFACE. USING A TABLESPOON MAKE 8 DEPRESSIONS IN THE BEANS ABOUT 1-2 INCHES APART. THESE ARE FOR THE EGG YOLKS TO SETTLE INTO. CRACK EACH EGG INTO A SMALL BOWL AND POUR INTO THE DEPRESSION SO THE YOLK FALLS INTO THE CENTER. THIS WILL PREVENT THE YOLK FROM SLIDING ABOUT. COVER WITH FOIL. MAKE LARGE HOLES IN THE FOIL TO ALLOW STEAM TO ESCAPE. PLACE IN A PREHEATED OVEN AT 350F IN THE BOTTOM RUNG AND BAKE UNTIL WHITES ARE SET AND YOLKS SLIGHTLY FIRM. IF USING A STOVE SET THE SKILLET WITH THE PERFORATED FOIL ON A VERY LOW FLAME AND COOK UNTIL EGG WHITES ARE SET AND YOLKS JUST SLIGHTLY JIGGLY. SCATTER CHEESE OVER THE TOPS, COVER WITH FOIL AND LET SIT IN THE OVEN OR ON THE STOVE ABOUT 2-3 MINUTES. REMOVE FOIL GARNISH WITH HOT TOMATO SAUCE, GREEN SALSA, CHILLI SAUCE AND CORIANDER.